Yo-Yo Ma performed in Seattle on Friday, Oct. 14. With the Seattle Symphony’s associate conductor Pablo Rus Broseta on the podium Friday night, Ma gave a revelatory performance of one of the staples of the cello repertoire: the Haydn Concerto in C Major. Yo-Yo Ma: three short syllables that guarantee a performance to remember. 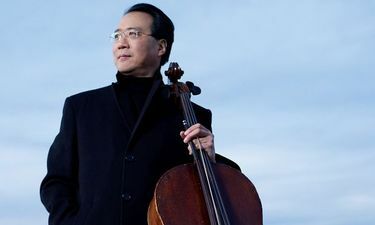 The great cellist and multifaceted musician has been performing in Seattle for about four decades (though never often enough), and he received a rock-star welcome in his latest arrival in Benaroya Hall on a windy Friday night. With the Seattle Symphony’s associate conductor Pablo Rus Broseta on the podium, Ma gave a revelatory performance of one of the staples of the cello repertoire: the Haydn Concerto in C Major. He has never been an artist to overstate or exaggerate, but this might have been the most exquisitely understated Haydn C Major ever to emerge from beneath the bow of a cello. Beautifully shaped, poetically soaring lines floated the melodies out into the audience, and you could see people leaning forward in their seats to listen. And not just to listen. During the first-movement cadenza, when Ma scooted up to hit a bravura high G, an appreciative voice in the back of the hall declaimed, “Yeah.” It might not have been ideal concert etiquette, but it was what most of us were thinking. The tremendous subtlety, accuracy and lyricism of Ma’s playing made listeners re-imagine the whole idea of a concerto. His approach was never “Look at me, the great soloist!” Instead, Ma’s attitude conveyed, “Hear how beautiful this music is.” Everything he does is in service to the score. Unlike most soloists, Ma likes to play along with the orchestra in the tutti passages as if he were a cello-section member, viewing the music as a joint enterprise rather than a star vehicle. Even the encores were a community affair: At the end of the program, after a remarkably enthusiastic ovation, Ma asked the audience what they’d like to hear. From the many shouted suggestions he picked two: Bach’s Prelude to the G Major Cello Suite (No. 1), and the sublimely simple “Appalachia Waltz” of Mark O’Connor. Those serene last notes were like a benediction. Broseta made a good impression not only as an able and subtle partner in the concerto but in the three orchestral pieces preceding it. Beginning with some nicely characterized Bartok (the “Romanian Folk Dances,” with particularly fine playing from clarinetist Ben Lulich), Broseta also presented some elegant and nimble Mozart: the familiar Symphony No. 29 in A Major (K.201), and the less familiar Symphony in D Major (K.196/121). These were well-received hors d’oeuvres for the evening’s main event.